We take great pride in giving back to the communities we call home and would love to help you raise money for your non-profit organization and/or cause. To request complimentary tickets from Helium Comedy Club, please review the eligibility guidelines and complete the form on this page. Requests must be received at least 4 weeks prior to your fundraiser's date in order to be considered. All ticket donations are mailed directly from Helium Comedy Club and require one week to ship. Unfortunately, due to the large number of requests we receive daily, we are unable to fulfill all requests and can only notify organizations that are approved. We cannot support organizations that discriminate against a person or group on the basis of age, political affiliation, race, national origin, ethnicity, gender, disability, sexual orientation or religious belief. Host your next fundraising event at Helium Comedy Club! We're eager and equipped to help you raise money for your cause, with turnkey event structure, a unique and fun atmosphere, and a comprehensive menu your guests and participants are sure to enjoy. 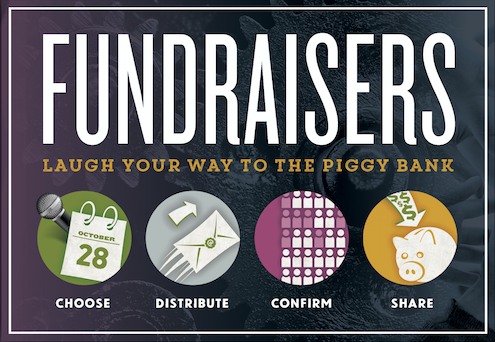 To request more information about hosting your next fundraising event at our club, click here.